Now that Laurie is complete, I am focusing on the parlour guitar build I last wrote about in February. When we left the parlour guitar earlier this year the neck blank had been glued up. The first task was then to true the gluing surface for the fretboard (both flat, and square to the sides of the neck blank), and to plane the headstock to the correct angle. All of this was achieved using my trusty Clifton No 5 plane (almost certainly my favourite hand tool), checking with a straight edge to ensure that the gluing surface was free of hollows or bumps. 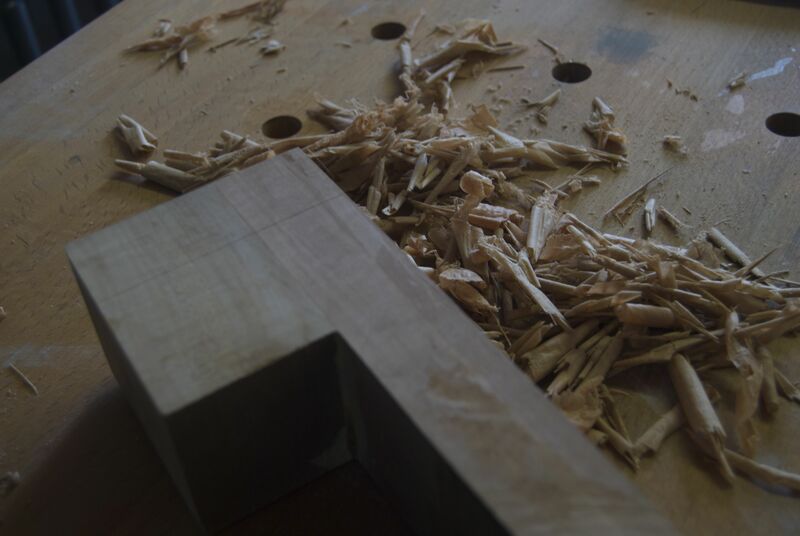 A couple of areas were also worked locally with a block plane. Once the neck had been planed true and square, I marked out the centreline, edge of the fretboard (the neck blank is at present oversized), position of 12th fret and the nut, using a making knife. The centreline was carried over the heel block and onto the base of the heel. In the past I’ve used a scalpel although I now use a marking knife by Blue Spruce Tool Works. I find the marking knife to give a clearer, deeper, line than the scalpel, and has the advantage of being less flexible than the scalpel blade (which makes it less prone to wandering). The large flat back of the marking knife blade also registers against a ruler or square better when marking round several faces of timber, which is particularly advantageous when transferring the centreline to 3 faces of the heel block. There are a number of different ways to attach acoustic guitar necks to their bodies, and although bolt on necks are increasingly popular, I use the more traditional Spanish Heel (also known as the Slipper Heel) joint. In this joint, the neck contains an integral heel block (rather than the heel block being separate, as with bolt on necks), and slots are cut into each side of the neck, into which the sides are wedged. The soundboard and back are then glued to the neck. This provides a very stable, strong joint, although obviously does come at a cost if there is ever a need to reset the neck. Before I could cut the slots for the Spanish Heel I needed to calculate the angle of the neck in relation to the body, which would in turn dictate the angle of the heel slots. This angle is calculated by reference to the location of the neck/ body join (12th fret in this case), the neck wood being used, and the intended gauge of strings and desired playing action. Rather than manually calculating the neck angle for each guitar, I have built an Excel spreadsheet which contains the 3 formulae, into which the specific measurements for each guitar can be input (geometry not being something I want to spend anymore time on than necessary). For this guitar, the neck will be angled back so that the top edge of the neck is 4mm below the body datum at the first fret. Having plotted the position of the neck onto the technical drawing for the guitar, I could then transfer the angle of the heel slot at the 12th fret onto the neck blank using a sliding bevel and marking knife. The heel slots are 8mm wide at the top of the neck, and 12mm wide at the bottom of the heel, with a depth of 14mm. These dimensions were then plotted out on the neck blank. The neck post will look at cutting the Slipper Heel slots to accept the guitar sides.